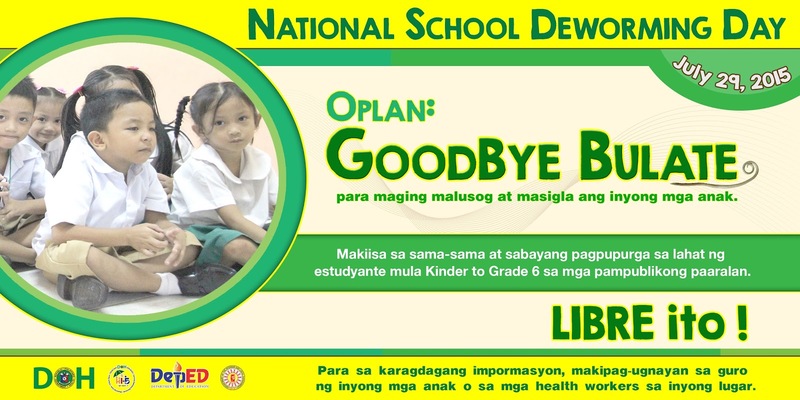 Last year, the Department of Health launched the National School Deworming Day (NSDD) - a timely initiative that combined the need to actually treat children for intestinal parasitism and the need to educate public the importance of deworming in children’s health and nutrition. Unfortunately, it was marred by reports of children being brought to hospitals after taking the deworming tablets, and rumors of more serious problems. The most virulent rumor was that children actually died as a result of the deworming, amplified by the radio station in Pagadian City which actually reported it. DOH officials now suggest that this rumor was a major reason many parents actually brought their children to the hospitals. “They just wanted to be sure,” an Inquirer report cited a nurse as saying. Then there were intrigues suggesting that the chewable Albendazole tablets given to the children were expired. DOH Secretary Janette Garin had to show the actual tablets used in the deworming to show that expiration is not until 2017. What can explain the alarm? First, some of the children could be experiencing the body’s natural reaction to the drug. Upset stomach is one of the common side effects of Albendazole, and the process of deworming could be felt as a sign that the drug . Studies show that the more worms children have, the more they might experience drug-related reactions. Second, some of the cases can be attributed to “mass hysteria” or “mass psychogenic illness”. My colleague Dr. Harvy Liwanag, who has worked in parasitology research, recounts a deworming activity in Negros Oriental where, there was suddenly a large number of schoolchildren complaining of the same symptoms. The exact mechanism of mass hysteria remains poorly understood by scientists. The fear of having been poisoned by the drug could itself be a cause for the symptoms children experience, as when some parents in Zamboanga were reported to have given remedies like coconut milk and coconut oil that could very well cause upset stomach. But the damage has been done. Some towns actually suspended the deworming activtiy as soon as the reports came in, and there were also reports of parents refusing to send their children to school. My medical colleagues say that some of their patients are already telling them that they will never allow their children to take deworming tablets again. Thus, while emphasizing that medical problems were dealt with, the DOH must now seek to manage the epidemic of fear that could greatly undermine deworming efforts in our country. Misconceptions about diseases and their treatments can be as devastating the diseases themselves. The widely-discredited claim that measles, mumps, and rubella (MMR) vaccines can cause autism continues to be believed by many parents, and is directly responsible for the increased incidence of mumps and measles - as well as deaths from these otherwise-preventable viral infections. In the Philippines, we have a similar example in the tetanus-infertility scare in the 1990s. Following a report that showed traces of a hCG, human hormone in tetanus vaccines, various groups quickly jumped to the conclusion that the anti-tetanus vaccine can cause infertility (the hCG levels were far too low to be significant). This too, has led to many people refusing tetanus shots, rendering themselves - including their babies - at risk of contracting an deadly infection. These cases remind us that people do develop misconceptions about health interventions, even in the face of unequivocal scientific data. Enough people believe in the measles-autism link in the US that some politicians are even cowered into not taking a clear stand about it. The malignancy towards which these rumors can escalate should make the DOH redouble its efforts in conducting a thorough investigation and providing an explanation of this deworming incident in way that the public can easily understand. Intestinal parasitism is one of the reasons why Filipino children are malnourished; why many children are stunted, and consequently, why many Filipinos are short. These truths must also be emphasized. One very recent study in the US showed that parents are more likely to vaccinate their children when informed of the risks of a certain disase, than assurances that the vaccine against it is safe and effective. Rather than sensationalize the reports and intrigues, the media for their part should be mindful that they can be an accessory to the propagation of this epidemic of fear. Even if we accept it as natural that the media will highlight the hundreds who were hospitalized over the millions who weren’t, there is no room for reporting based on rumors - as that radio broadcaster in Pagadian did. Of course, anticipating adverse reactions and orienting everyone about what to expect are crucial parts of any health intervention. If, as Undersecrtary Dr. Vicente Belizario reminds us, the “chemical reactions are signs that the drug is working or showing its effectiveness,” then this should be relayed in advance to children, teachers, and parents. And if, as Dr. Eduardo Janairo of DOH MIMAROPA said, children should have eaten something before taking the medicine, then this too, should be (even more) emphasized. As the National School Deworming Day - and deworming incident in Zamboanga demonstrates - public health is not just about documenting health problems and coming up with programs to deal with them. It is also about successfully communicating these problems - and programs - to the people.